« Homepage / Research / "Bionettoyage"
The bionettoyage is a cleaning whose objective is to reduce the amount of microorganisms present on surfaces. It combines a cleaning with a rinse and disinfection. It occurs in the risk areas, where persons or goods are sensitive to the presence of micro-organisms. Use of two separate products, detergent and disinfectant. cleaning: it allows to eliminate dirt and detergent microorganisms (bio film) using a product. It eliminates much of the microorganisms present on the surface. rinsing: eliminates grime, microorganisms, suspended by the detergent, and traces of product detergent. disinfection: it takes place by contact or by spraying a disinfectant containing biocides destroy microorganisms. Some detergents and disinfectants, products noted SD for detergent and disinfectant, allow to carry out the cleaning and disinfection at the same time. Security: professional training is necessary. Risk of projection in the eye glasses are best, for spraying of a mask. The economy: the disinfectant detergent solution is used within 24 hours. 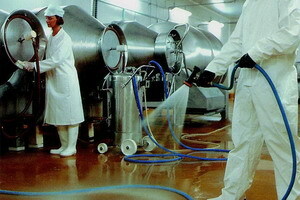 The amount of solution required for the day, is prepared according to the rooms to bionettoyer. Communication: it will be necessary to transmit to the whole team the conditions to take for this activity, the high level of communication, or disinfectant that should choose risk. The quality of the service: it is assessed by a Visual control and microbiological control by sampling on a culture medium, which allows to identify and quantify the microorganisms present on the control surface. In the hospital environment, the environment of the restoration and the laundry, the microbiological control of surfaces can create a quality indicator. This type of control is most often performed by a biohygiéniste, or a person designated in the removed service. The result will have value only if and only if the realized bionettoyage prior matches well in the daily. Finally the interpretation of the results has limits. The middle of collection called agar contact plate covers an area of 25 cm². It is difficult to imagine on a surface of 2 m ² that a single sample of 25 cm² is estimating the quality of the bionettoyage on such a surface. It therefore kept proportion not abuse these levies. In fact what seems own microbiologically on the surface may well be in fact an evil bionettoyée with other surface locations not collected. The collection of surface must not be a scientific way to estimate the quality of the bionettoyage, on the other hand it can be used as a teaching method to the bionettoyage staff.